for the Glazier investigation. And it still ain’t over. Adam Jude has the latest in the Oregonian. Here’s a (dated) billing statement – approved by Jamie Moffitt, showing the split. Has Gottfredson put a stop to this? Good question, I’ve put in a public records request. Meanwhile, more here from the last go-round on this. From CNN. A study of NFL veterans, but there are no obvious reasons it can’t be done on college “student-athletes”. 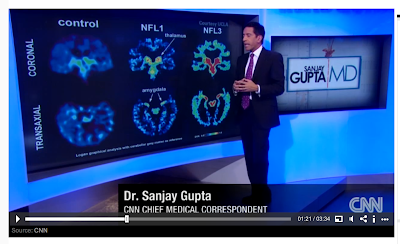 The previous CTE tests required waiting for death and an autopsy, this is PET on live people, or, as the legal profession calls them, “plaintiffs”. Here’s hoping Randy Geller and Jamie Moffitt have done their due diligence and bought the Ducks some serious liability insurance. 1/22/13. And to top that off, Oregon state Rep Mitch Greenlick is going to hold hearings on UO’s hiring of Mark Helfrich without an honest, open, affirmative action compliant search. Mullens will have a hard time avoiding testifying. Dianne Dietz of the RG has the story on LCC. Earlier story with more details here. If someone can explain why this is not a really bad idea, please do. James Madison, 1822: "The Tuition is Too Damn High"
Without such Institutions, the more costly of which can scarcely be provided by individual means, none but the few whose wealth enables them to support their sons abroad can give them the fullest education; and in proportion as this is done, the influence is monopolized which superior information every where possesses…. A system comprizing the Learned Institutions may be still further recommended to the more indigent class of Citizens by such an arrangement as was reported to the General Assembly of Virginia, in the year 1779, by a Committee appointed to revise laws in order to adapt them to the genius of Republican Government. It made part of a “Bill for the more general diffusion of knowledge” that wherever a youth was ascertained to possess talents meriting an education which his parents could not afford, he should be carried forward at the public expence, from seminary to seminary, to the completion of his studies at the highest. I don’t know what kind of run-around our students got from Berdahl and Moffitt, but if it’s anything like the one Moffitt gave the IAC last year, I suggest they keep digging. 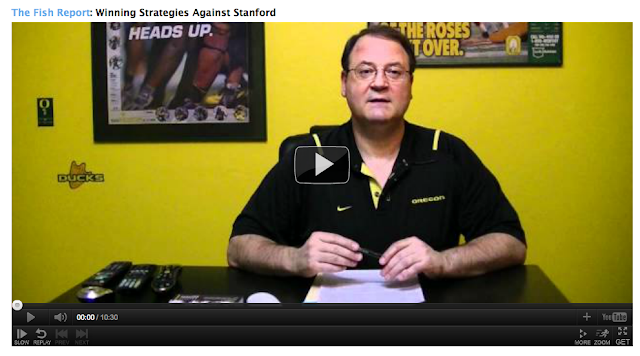 And for the sake of UO, I hope Moffitt stops – that athletics hole is deep enough already. 6/8/2012. 4/10/2012: Randy Geller spent almost 4 weeks going through these with his whiteout bottle, but here they are. 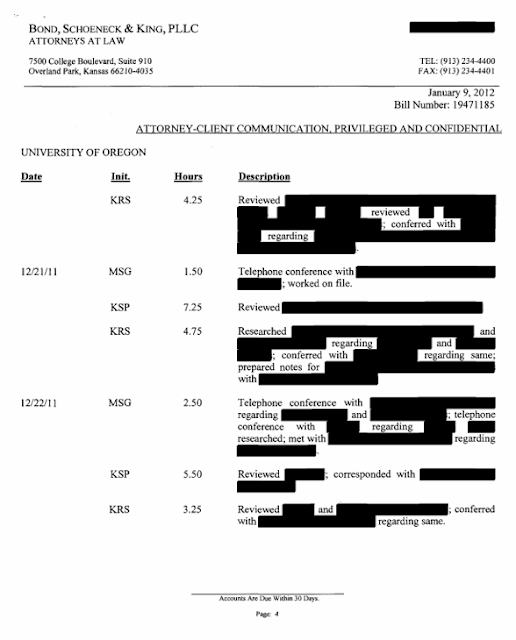 Looks like UO hired Mike Glazier last month for a second project, reviewing NCAA compliance. $9,245 in billing on that, plus $11,194.79 for the Willie Lyles football recruiting cleanup. No worries, UO athletics is self supporting, and can surely cover this without taking any student tuition money. Or at least that’s what UO’s VPFA Jamie Moffitt has been claiming. All 10 pages here. The total legal costs — $419,000 — dwarf the $5,583 in damages that a jury awarded Schlossberg in January, after deciding unanimously that his constitutional rights were violated by Solesbee during a March 13, 2009, encounter in front of an Umpqua Bank branch in downtown Eugene. The University of Oregon in Eugene seeks an experienced, senior, commissioned law enforcement professional with superlative people skills and leadership ability to fill the position of Police Captain with the Safe Campus Team at the Department of Public Safety (UODPS). Doesn’t sound cheap. And rumor has it they’ve also hired a $10,000 a month consultant. Meanwhile DPS Director Doug Tripp – already paid more than the Eugene police chief – is in Salem for 4 months, going through basic Oregon police academy training. Frances Dyke told the campus – and Floyd Prozanski and the state legislature – that the conversion to sworn police would cost UO almost nothing. She lied. Will new UO CFO Jamie Moffitt come clean on this? $2.6 million, growth over 10 years, nearly tripling their budget. But now that the conversion to sworn police is starting, things are really going to get expensive. Word down at the Baron’s Den is that UO has hired a $10,000 a month consultant (a retired Eugene police captain) to plan how to spend all that money. Becky Metrick of the ODE has some news on the 6 year plan that is being put together. That will be an interesting budget to see. December’s entire bill is $15,441.41. I’m no art history professor, but I think this page has the most aesthetically appealing redactions, though page 2 has a certain stark symmetry. 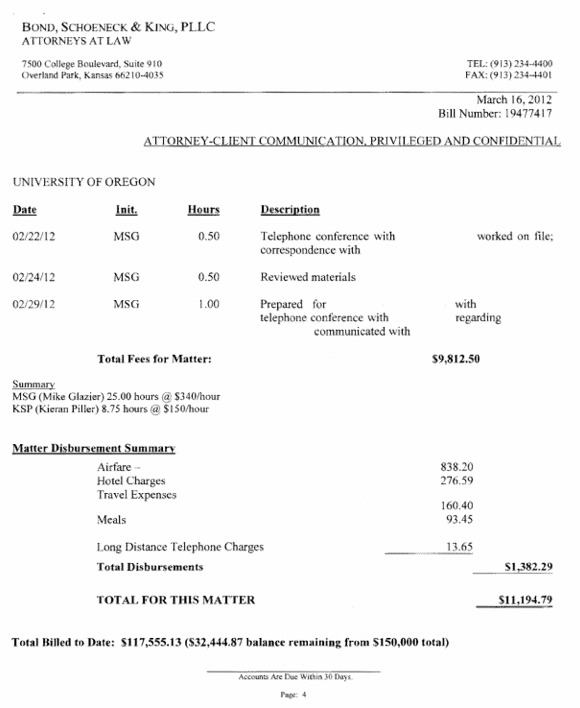 Per the agreement between UO’s general counsel Randy Geller and CFO Jamie Moffitt, the academic side is on the hook for half the total for Mike Glazier’s cleanup of the Willie Lyles scandal – now $100,527.44. You’d think this would mean we’d be allowed to read at least half the words in his invoice. PS – Thanks to bojack.org for his link to this. The statutes governing PERS include a loose definition of what constitutes “salary”: “the remuneration paid an employee in cash out of the funds of a public employer in return for services to the employer.” For employees hired after 1995, federal tax rules have limited the final salary reportable to PERS — $245,000 in 2011. But that doesn’t apply to Tier One PERS members such as Bellotti. What pumped up his base pay were contract provisions that gave him a $325,000 share of the university’s endorsement contract with Nike and Oregon Sport Network each year, as well as a piece of the Ducks season ticket sales. Bellotti’s contract defined endorsement and network deals as “Opportunities to earn outside income.” But because the university handled them as a transfer of its own revenue, the endorsement money is included in his university pay, and his benefit calculation. … At retirement, Bellotti’s post divorce account balance was only $300,000. The university made its own contributions over the 21 years he was employed. But combined, they won’t come close to covering the $5 million benefit reserve that PERS established to cover his payments. Moreover, that reserve may underestimate the costs, depending on the state’s investment returns and Bellotti’s longevity. No wonder the rest of the state hates us. So, has Executive Senior Associate Athletic Director for Finance and Administration Jamie Moffitt – soon to be UO’s Chief Financial Officer – been letting this rip-off continue for AD Rob Mullens and for Chip Kelly and the other coaches? Seems like the new federal rules may prohibit it. Or perhaps they’ve figured out a new scam. Go Ducks! 11/17/2011: Here at UO Matters our sports editors focus on the highly effective strategies that UO Athletic Director Rob Mullens and his “Executive Senior Associate Athletic Director for Finance and Administration” Jamie Moffitt have been using to squeeze every last dime from UO students and the academic side, to pay for the coach’s salaries and their own free cars.